Marcin, who is 26, is a colaholic. The fizzy beverage accompanied him during his play as a child, when doing homework and at school breaks. Quite imperceptibly, drinking Coca-Cola became as natural for him as having lunch or going out for a walk. 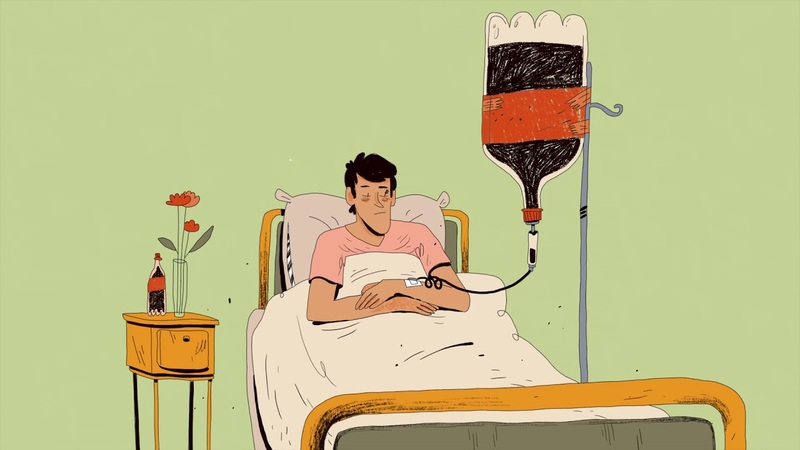 In the style of a cartoon, Marcin Podolec shows the feeling of emptiness after breaking the addiction, no different from longing for rejected love, which is why this documentary animation was made in the convention of a romantic comedy. Marcin Podolec - born in 1991 in Jarosław, Poland; comic artist, animator, currently works mostly on documentaries and biographies. A graduate (2015) of The Polish National Film School in Lodz (Animation department). His books are published by Kultura Gniewu; co-author of the comic albums: Captain Sheer (2010), Insight (2014) and Sometimes (2011), which was awarded The Comic Book of the Year in Poland; writer and illustrator of All Taken (2012) and Fugazi Music Club (2013), which was sold to several international publishers (Italy, France, Germany, Spain). His short animadoc A Documentary Film (2015) was screened and awarded at many film festivals, such as the DOK Lepizig, SICAF (Seoul) and Clermont-Ferrand Film Festival. His next animated documentary, The Gentle Giant (2016), is his graduate film.